Botulinum toxin injections can be an effective therapy for various movement disorders. 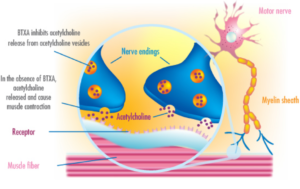 The injections work by preventing the release of a neurotransmiiter called acetocholine. Blocking this release may result in reduced muscle spasms, reduced pain and reduction in drooling. There are various types of Botulinum toxins that are used to address different disorders and medical issues. Many insurances will cover Botulinum toxin when ordered and administered by a medical professional. Dr. Samanta and Dr. Ospina can talk with you about whether this treatment is right for you and our office can assist you with evaluating insurance coverage. Because every person is different, the effectiveness of this therapy varies from person to person.